Listen to "Guests of the Ayatollah" on your iOS and Android device. On November 4, 1979, a group of radical Islamist students, inspired by revolutionary Iranian leader Ayatollah Khomeini, stormed the U.S. embassy in Tehran. They took fifty-two Americans hostage and kept nearly all of them captive 444 days. The Iran hostage crisis was a watershed moment in American history. It was America's first showdown with Islamic fundamentalism, a confrontation at the forefront of American policy to this day. It was also a powerful dramatic story that captivated the American people, launched yellow-ribbon campaigns, made celebrities of the hostage's families, and crippled the reelection campaign of President Jimmy Carter. Mark Bowden tells this sweeping story through the eyes of the hostages, their radical, naïve captors, the soldiers sent on the impossible mission to free them, and the diplomats working to end the crisis. Taking listeners from the Oval Office to the hostages' cells, Guests of the Ayatollah is a remarkably detailed, brilliantly re-created, and suspenseful account of a crisis that gripped and ultimately changed the world. This should be the last of book or video I’m reading or watching about the Iran hostage crisis of 1979-1980 for a while. I feel as if I’ve got a good handle on it. The reason this is the last book is because the writer is Mark Bowden. He is thorough, a good writer and has a pleasant voice. This book helped put the things I learned after reading and watching things from a few perspectives into the big picture. When the audio book ending I had the biggest shock of all—it was an abridgement. This was the best abridgement I have ever heard. The staff at Simon & Simon Audio did an outstanding job. I am a big fan of a couple of Mark Bowden's other books which I've read - Black Hawk Down, and Killing Pablo - so, when I decided to "read" a bit about a political event which happened before I was born, I picked this book. Yeah, I'm a nerd. I love a gripping true life political story. Guests of the Ayatollah started well, launching me into the different sides of the story with great hooks for each perspective. However, when I got to disc 4 or so, things really slowed down. It must have been before that, because I swear that I felt like I was slogging through most of discs 3 through 7. Oy. 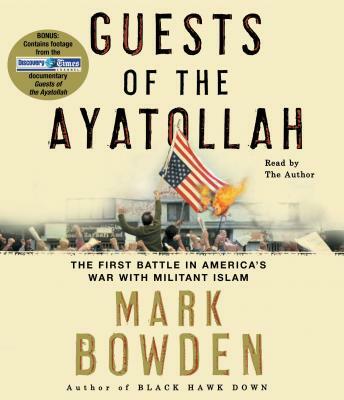 Nonetheless, I learned a lot about the Iran Hostage Crisis (the topic of the audiobook), got some interesting insight into Carter's role in it (which I'm sure that my elders would disagree with), and I kind of liked Mark Bowden's voice (he reads his own book). So, I give it three out of five stars. Written like a thriller, yet scrupulously researched and documented, this book is packed with first hand accounts from U.S. hostages, Iranian hostage-takers and jailers, and our brave military personnel involved in the aborted rescue attempt. Bowden relates how the Iranian student revolutionaries efforts to replace an oppressive shah with a lawless coup has ironically led to the hyper-dictatorship of a murderous "mullah-ocracy" for the last 30 years. This audio book is a must for any American born after 1960 who may not recall, or those who may have been born after, the heart-sickening hostage crisis our nation experienced when Iran illegally invaded the US embassy in Tehran and imprisoned our diplomats and staff for 444 days. Iran comitted a crime against these individuals, our country and the international community...something to keep in mind as Iran strives to become a nuclear power.